After having wrapped-up my challenges for 2014, here are some I'm planning to complete in 2014. I haven't really been around in late December so I might have missed some cool ones. If I spot them, I'll make a post about joining them later. Apart from themed challenges, I set my Goodreads Reading Challenge to 150 books again, but I might not make it this time. I had a lot of fun with this challenge in 2013 and found it very motivating! This year, Bookish is hosting it alone. You can sign up here. There will be a wrap-up post every month on the 20th, and there will be prizes! Rules: only books published 2013 or earlier, no ARCs or new 2014 releases. Last year, I would have been Married With Children (75 books), but as for now I'm opting for a Sweet Summer Fling with 31-40 because I'm anticipating a busy year. This one is hosted by Caro from The Book Rogue and you can sign up here. It's about books you actually want to read but just can't bring yourself to for some reason. Something irks you about them. They've been sitting on your shelf forever. There can be various reasons, to be determined by those signing up for themselves. The Abhorsen trilogy, by Garth Nix. Why: I have all three novels collected in one fat tome. It's like 1200 pages and really heavy. But I've wanted to read these books for about 10 years and owned the collection for 2 or 3. So it's time. Tintenherz (Ink Heart), by Cornelia Funke. I really want to read this one in the German original, but I'm always so reluctant with German books. Not because the language is a problem (I'm Swiss so I grew up with it) but because the German writing style... I don't know. I'm not used to it anymore and it's not really my thing. The Taker, by Alma Katsu. I bought this one really cheap more than a year ago and still haven't read it. I think it will be great, but somehow I keep putting it off. Gone with the Wind, by Margaret Mitchell. It's a classic, and though I'm an English Lit major I actually haven't read that many American classics. I'm more familiar with English ones. Also, I'm a bit afraid that I might hate Scarlett. I'm leaving the 5th book open for now, but I might pick an Anna Rice one that I haven't read yet. I like her novels but sometimes I have a hard time getting into them so I tend to be a bit reluctant. Ah, the joys of Re-Reading. I used to know them very well as a teen, but now it's been so long since I've been able to re-read some of my old favorites! I only re-read 1 books in 2013. It's a pity. I was meaning for it to be so many more! 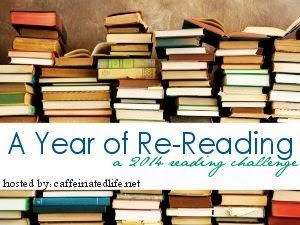 So this time around, I've joined the Re-Reading challenge hosted by Lianne from Caffeinatedlife.net. If you're interested, you can sign up here. There are several available levels, but I think Occasional Re-Reader (1-4 books) is most realistic for me. Neil Gaiman - Neverwhere or American Gods. I've been meaning to re-read both, but I've got the audiobook of Neverwhere so I might read American Gods as a book and listen to the other one. The Replacement, by Brenna Yovanoff. I only read it about a year ago but I'm hearing the call. Katzenwinter, by Wolfgang Hohlbein. This is one of the first fantasy books I've ever read and I recently found it at the used books store. The Lord of the Rings, by JRR Tokien. I've read it 4 times, but the last time was when I was about 14. And I've never read it in English, only German. Even though I have an English hardcover edition illustrated by Alan Lee. Shame on me. I think that's it with the challenges for me, unless I stumble across something really awesome. I'll be back tomorrow with my blogger resolutions for 2014. Have you joined any challenges? Why / why not? 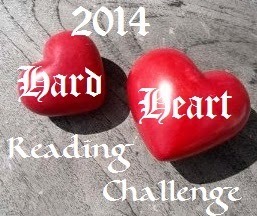 I signed up for TBR challenge, too, along with 4 others. I wanted to join in some more but I'm already participating in lots of yearly challenges on Goodreads. I'm a true challenge addict ;) good luck with these! Wow, that really sounds like you've got your plate quite full o.O I didn't know there were that many different challenges on GR! I decided not to sign up for any challenges, other than the GR one, because I never follow-through with them. It amazes me how other people are able to keep track of them, though...good luck!